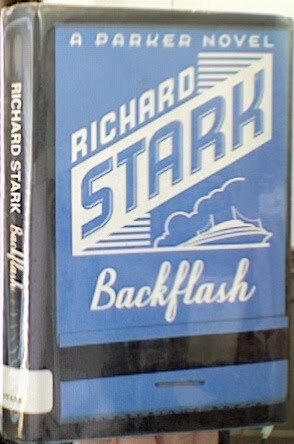 A US first edition of Backflash, the eighteenth Parker novel (and second in the second run of books, following Comeback), published in hardback by Mysterious Press in 1998. 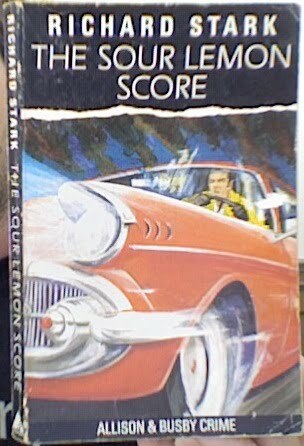 I mentioned before I wasn't terribly keen on the jacket design that Mysterious Press introduced for the US Parker novels with this book, and that I intended to collect the UK Robert Hale editions instead. But I saw this for sale on eBay from the UK, for cheaper than the Robert Hale edition, and thought, sod it. And actually, now I have the book, that jacket is more interesting than I first reckoned. Designers Jackie Merri Meyer and Rachel McClain have taken Daniel Pelavin's hand-lettering and illustration and slapped them onto what looks like a file or envelope, complete with staple at the bottom. The whole file has then been shifted so it looks skewiff, and the edges blurred as if it's a microfilm, I guess to emphasize the 'mystery' nature of the book, in line with Time Warner imprint it's published by. Of course, Parker novels aren't really mysteries, although they do often have mystery elements in them, or rather aspects of the plots that Parker himself is unaware of but that get revealed to us during the Stark Cutaways. So, not quite sure if that is the effect the designers were going for, but I don't mind the end result. I think I will pick up the rest of the later Parkers in Robert Hale editions, though, particularly seeing as I already have Firebreak in that edition. Grand Rapids is in Michigan. Given the value and scarcity of some of the Parker books, I've been wondering if you are actually reading your newly acquired copies. Or do you have reading copies and collectible copies? Volvanos permitting, it's The List! Lawks a' mercy, missus, it's The List!